Black Ice Software - BiBatchConverter version 4.10 is released! BiBatchConverter version 4.10 is released! 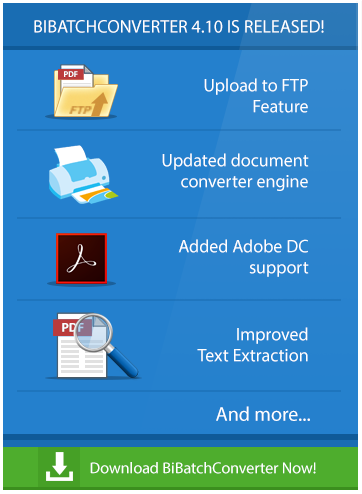 Updated document converter engine, Upload to FTP Feature, Adobe Reader DC support, MSI installer, Improved Extract Text Feature and more ….! Black Ice Software has released the BiBatchConverter version 4.10 includes great new features and major improvements! The new BiBatchConverter includes a updated document printing module for faster and more reliable conversion of complex document, more detailed error reporting and new capabilities to fine tuning the conversion for problematic documents. Support for printing PDF documents with Adobe Reader DC. Version 4.10 of the BiBatchConverter includes a new feature to Upload the converted documents to an FTP Server, new EMF output file format, and improvements in the Extract Text feature especially for Hebrew and Arabic documents. Version 4.10 of the BiBatchConverter also includes new predefined profiles to split multipage PDF and TIFF documents into single file, updated documentation and dozens of improvements to enhance user's experience.